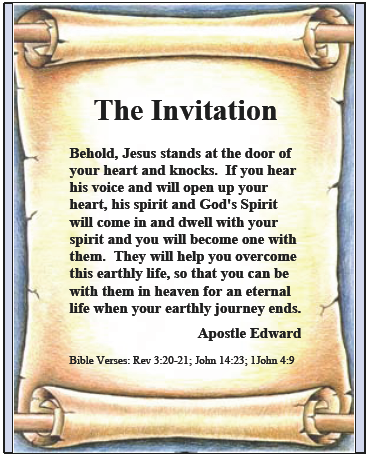 Apostle Edward | The Invitation | Behold, Jesus stands at the door of your heart and knocks. Exactly what does it mean to open up your heart to God and His only begotten human Son Jesus? Well, it's really quite simple if you think about it. Doesn't everyone you love occupy a special place "in your heart" where joy, happiness, sadness and even heartache or heartbreak can occur? When you choose to love someone, you open up your heart to all the emotions associated with that love. The same thing occurs with God. He wants to be in that special place called your heart. Jesus gives us a second chance offer by knocking on the door of our hearts asking us to "open up." Hello! Do you know that life begins after our earthly journey ends? Do you know about "The Invitation" from God? God sent Jesus to remind us once again that the "kingdom of heaven" is real. That there is an afterlife for those who will repent and return back to God. Jesus was not the first to offer us this invitation to an eternal life. God said: "You will find Me when you search for Me with all your heart!" In order for you to search for God with all your heart, you'll have to acknowledge that God exists and step into the realm of faith. You approach God with your whole heart in faith. Exercising faith means you do not have all the answers. If you had the answers, you would not need to exercise faith/hope. The more you know God's Word, the easier it is to exercise faith. Only by exercising faith can you become born-again. You were first born of a woman [flesh]. Becoming born again means that you are born of the Spirit by returning to and acknowledging your God, our Creator. You return to God by exercising the faith of a child, by accepting God's Word as truth. Many preach that you are born again by accepting Jesus Christ as your Savior. However, this is not the complete truth of salvation. Accepting Christ as savior must go beyond just mouthing him as Lord. Jesus rejects many Christians who claim that he is their savior. We don't have to guess why, because Jesus tells us why in verse 23. So, in Jesus' own words, we see that just claiming him, as savior with our mouths, is not enough in spite of what many people preach. Paul explains to King Agrippa in Acts the instructions he received from Jesus. So, in Christ's mind, you have at least FOUR things to do to get your inheritance, which is an eternal life in heaven. This is the invitation I am talking about. 1. You open up your eyes. This means you open up your heart and listen to God and His Son Jesus. That you take to your heart the message now being given. 2. You turn from darkness to light. This means that you focus on God's ways; not on man's ways. 3. You turn from the power of Satan to God. This means that you repent of your sins and tap into the power of God. It means that you choose to become one with God and His Son Jesus. 4. You are sanctified by faith in Jesus. This means you are made holy before God's eyes because you have chosen to believe in God's only begotten human Son – Jesus Christ of Nazareth. Your faith is then followed by obedience. What a wonderful verse this is, but if you stopped here in John, you would miss the message in verse 36. Some bibles state the last part clearer in that the wrath of God abides on those who do not obey the Son. Therefore, you must not only believe in Jesus, but you must believe what he taught and obey his commands. Many Christians have been misled by false doctrines and no longer know the God that Christ served. Worse, they have mistakenly substituted Christ as their God. We know this because the manmade tradition called the "trinity doctrine" has negated the actual teachings of Jesus Christ and Paul in many churches. Listen carefully, it's important. If you are a true believer in Jesus, you listen to his words and you have returned back to his Father, our God. That means you know the Father, God Almighty, who is known as Yahweh, Jehovah, Lord, and also designated in Hebrew by Ywhw. Lord replaces Ywhw in bibles to designate God. These are very simple words from Jesus. He speaks of the God we all serve, including he himself. However, many who believe in the trinity doctrine, cannot accept these words as they are written. Perverse doctrines now distort and twist the words of Christ for the purpose of leading people to hell. Is it important to know the God that Christ served? Yes, it is, and the Apostle Paul tells us why in 2 Thessalonians 1:8. Jesus taught us that the Father was his God and also our God. The Apostle Paul taught us the same thing about God in Corinthians! This means we are of God and created by Him, but we live through Christ Jesus and by faith in Christ we are obedient to God. It is our faith in Christ that welcomes his spirit and the spirit of his God into our heart. When we operate in faith, without having all the human answers, the door to our heart opens wide to our savior Jesus and his God. It is our obedience to God that then allows us to overcome this world. The spirits of my wife Jackie and I became one-flesh. Of course, we were not literally one flesh, but in spiritual terms we were one flesh. We were of the same mind, the same spirit and because of this we thought alike on almost everything. We were not robots. Both of us had different opinions at times, but still, we were basically of one mind. Because we were one with each other, we often completed each other's sentences and even knew what the other was thinking long before any words were spoken. I often could hear her voice speaking to me or hear her mind thinking about me. The same thing occurred with her. I cannot fully explain this in human terms, because it is a spiritual mystery that comes into play when a love bond is very strong between two people. However, many who made a commitment to love for a lifetime can testify to the wonderment that they were of one-flesh with their spouse. After my wife Jackie died in 2003, I could still hear her thoughts. I knew what she would think in every situation. For example: When I reached for a shirt, I could even hear her in my mind saying: "You can't wear that shirt with those pants." Jackie and I got to this place of wonderment of being one-flesh by giving all of our heart to each other. Our hearts were committed and unquestionably loyal to each other. God wants nothing less than a committed and loyal heart from you. If your heart is loyal and committed to Him, you will be amazed at the adventure He will bring to your life. Think about this! God Almighty will show Himself strong on your behalf if you give Him a loyal heart. It all starts when you just open up your heart in faith to His Son Jesus. You'll find the phrase born again used in the Bible in three locations: John 3:3, 3:7; and, in 1 Peter 1:23. Jesus talking to Nicodemus confirms in John 3:3 that you will need to be born again to enter the kingdom of God. In John 3:7-8, Jesus confirms that being born again means that you are born of the Spirit. Peter teaches that "born again" comes through the "incorruptible Word of God." *Two parts to Paul's born again formula. II) You believe in your heart unto God's righteousness. You want to do what is right in God's eyes. Many ministries promote a message that all you have to do is "mouth" that Jesus is your Lord and savior and you then have eternal life. You can now see that Jesus preached a different message and that Paul's salvation formula is two parts and not just one. Anyone who fully accepts Christ returns back to God, our Father and truly knows God and the fact that Jesus is not God. They do not worship Jesus or even pray to Jesus. They obey what Jesus taught them: Worship only the Father, our God; and, Pray to only the Father in Jesus' name. We pray to God in Jesus' name to honor his sacrifice on the cross and because he is our Teacher. Part II is belief in our hearts unto God's righteousness. In other words, we become obedient to God's righteousness standard. In the above verse, Jesus teaches us there is a minimum righteousness standard to get into heaven. Our righteousness must exceed that of the scribes and Pharisees. They often pretended to be righteous with God, but instead were wicked; they were hypocrites. Righteousness simply means you do what is right in God's eyes. Often this can be contrasted as being opposite of what is right in man's eyes. We know what God expects from us because the Bible tells us all about God's character and His likes and dislikes. Many believe the Bible is all about Jesus, but this is not true. These people fail to acknowledge Jesus was another messenger from God. The real story in the Bible is a great love story about our God who created us and loved us so much that He would send and sacrifice His only human Son in a final attempt to give us "The Invitation." To become saved, your mouth must confess the humanity [coming in the flesh], the death on the cross and the resurrection of Jesus. If you accept Jesus Christ in your heart as savior, he has brought you back to his God. You have, like I did – fallen in love with our Creator God who seeks fellowship with us. At this point, you'll be excited about your future eternity and you'll want to know more. You'll want to read the entire Bible. It was 30-years ago that I fell in love with God. Struggling with life seemed like the never ending story of my existence until one day God touched my life in a way that I knew He was absolutely real. "The Invitation" asks you to acknowledge that there is more going on in this earthly life than what your human senses can detect. There is another side to this life, a spiritual side. Unless you become born again in the spirit, you cannot begin to understand or for that matter even perceive truth in this life. Events in life happen for many reasons, but often those reasons have a spiritual basis. God sent His Son as a final sacrifice for the sins of mankind. In the process, God left us with an opportunity to step out in faith. Stepping out in faith requires that we open up our hearts and allow the Spirit of God and His Son to enter in and teach us the way home to our eternal life. This is your eternal invitation and it may be the only one you will ever receive in this life. Listen to God. "Then those who feared the Lord [God] spoke to one another, and the Lord [God] listened and heard them; so, a book of remembrance was written before Him for those who fear the Lord and who meditate on His name. If you know the God who sent Jesus, you already have eternal life and you will not be judged at the time of your death. God has always wanted the best for your life. His invitation for an eternal life did not just start with Jesus. An expression of God's great love for you can be found in Ezekiel chapter 18. From the beginning of history you will find God hoping for our best and hoping we would turn away from wickedness and to a life of righteousness. Righteousness brings us into fellowship with God. That is when we truly become His people for eternity. It's a choice for God in faith knowing that we are just travelers here on a temporary earthly journey. Our big decision on earth will be to accept the reality that God exists and that life truly transcends this existence. Knowing in our hearts that as Jesus was resurrected, so will God resurrect us. I am the Apostle Edward. I write to reach souls with God's invitation of an eternal life. However, I especially write to those souls who claim salvation through Christ, but have been misled to think that Christ is God. Many Christians do not know the God that Christ served. If this is you, your eternal life is in question. You need to get right with God and reject the church apostasy that has people now praying to and worshipping Jesus instead of the God that he served and taught us about. Anyone who worships the Son of God commits idolatry in God's eyes. Such people are not saved. Worship of Jesus is the same as worshipping any Priest or Pastor. God has said to have no other god's besides Him. That includes His Son.